I'm a nacho girl! 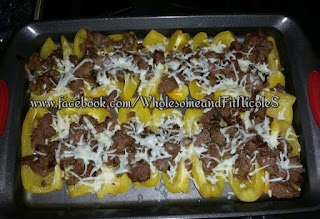 So when I found this healthy alternative I was super excited, Bell Pepper Nachos! These bad boys RULE! 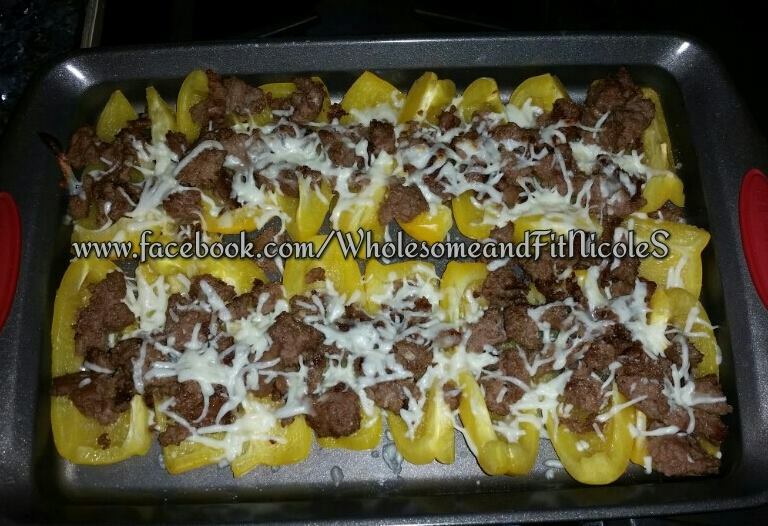 All you do is broil the bells upside down, turn them over and fill with browned ground turkey and top with mozzarella, top with salsa and there you hand it ... amazingness! You can add onions, black olives, green chili, the possibilities are endless. ENJOY!!! I’ve been exercising and eating right for many years . . . many, many years, sigh. In general, I think I’ve done a pretty good job. I am healthy. I am mobile. I am happy. 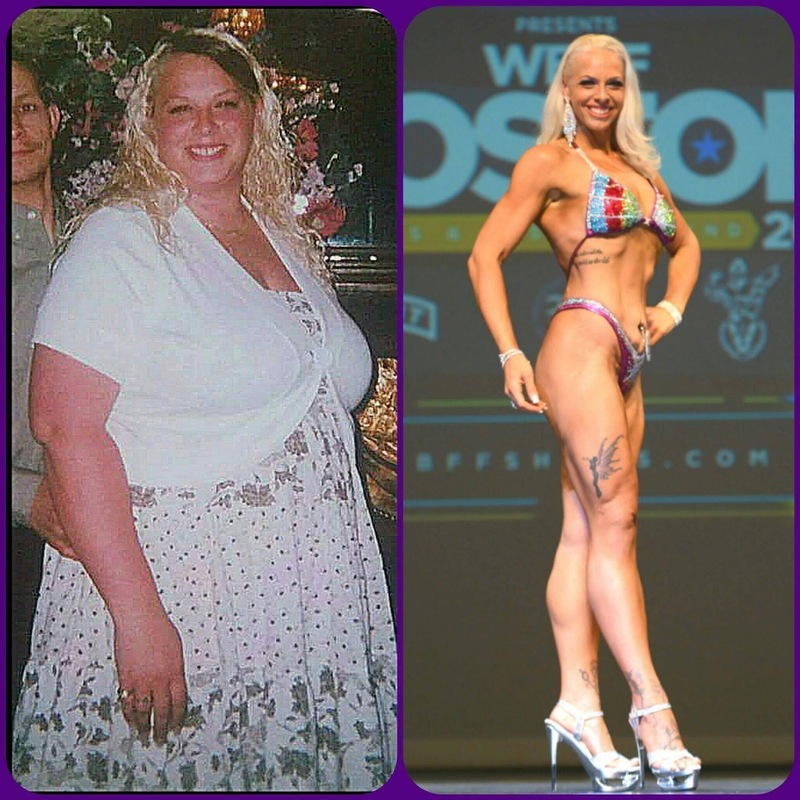 Yes, I am heavier than I was at a younger age – and I want to change that. And, no, I am not as strong or sturdy as I was at a younger age – and I want to change that as well. However, sometimes it is hard to find the motivation to really effect a positive change. Sometimes it feels like I am just going along, doing the same old thing and not striving for improvement. I think we all feel like this at times, I know I sure do. So in order to get out of my same ol’ routine, I recently joined a new online exercise and nutrition support group through the Beachbody community on Facebook to shake things up. Although we’ve just started this group, I am already finding that working with new people is a good thing. The members of the group have challenged me to think about things in a new way. The members of the group are positive. I feel like I have new friends and there is a built-in accountability aspect with the members of the group that comes from us checking in online with comments, suggestions, and ideas for improvement. And the support I have received is incredible. Previously I have used an app called MyChallengeTracker for another online group through Beachbody. I really liked this format. The app made it easy to log in, record the positive things I had done for the day in either exercise or nutrition, and it even reminded me if a day passed and I hadn’t logged an event. Ah, gotta love technology. Then there’s music. Music really is a motivator for me. 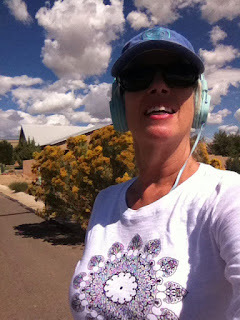 I love to put my headphones on and head out for a walk or a run. I’ve spent a fair amount of time organizing playlists on iTunes that suit my various moods. For example, I have a Latin playlist with songs by Marc Anthony and Romeo Santos, a Soundtracks playlist with songs from movies like Tron and The Hunger Games, and a Girls playlist with songs by Bette Midler, Amy Winehouse, and others. Then I use an exercise app called RunKeeper which tracks my distance, speed, duration, and plays my music all the while. If you are slacking in your exercise and nutrition efforts, consider where your motivation comes from. Are you the kind of person who is completely self-motivated? Do you spring out of bed ready to get in a run? Or, are you a person who really loves a good aerobics class at the local gym? Do you find that exercising (and chatting) with friends is how you like to spend your exercise time? Do you like to exercise indoors, or do you crave exercising outdoors? Whatever your normal routine is, think about a change. If you haven’t been to a yoga class, try one. If you normally go for a run, think about taking a swim. If you’ve been exercising alone, seek an exercise buddy. If you’ve been counting calories, try a once a week fast instead. Consider adding more vegetables to your plate, or think about tracking your nutrition through one of the apps available. Making a change can be very motivating. Find your motivation and stay healthy and fit! But saying it can be easier than getting out and doing it. I recently transitioned from living in a remote setting in the West to living in an urban setting in the South. Whoa! In addition to the challenge of exercising at all during the actual travel days (I didn’t), then I was faced with so many options for how to establish a new exercise routine. So, today I got out my yoga mat and got on the floor. Good. Step One done. Then I took an hour-long walk downtown. Okay, now. Step Two done. I feel better now. I am a little more limber. I got sunshine on my face. I burned a few calories. Now I am going to sit down with a cup of coffee and my Shakeology and think about what I want my new exercise routine to look like. Shall I take a class once a week? Shall I buy a new exercise video and workout at home? Shall I repeat today’s activities? Options! Whatever exercise options I decide upon, I know exercise will make me feel better and help me ease through all the other parts of the transition. Confession time! Although I focus on health and fitness in my life and in my business, I have been on a downward spiral lately with my personal fitness and nutrition. I have been feeling puffy and lethargic. I am the heaviest I have been in about 8 years, not counting pregnancies. I have been eating my emotions. I have will power one day and none the rest. I am not crushing my workouts like I used to. I am not running. I need to make a change, I want to make a change. I am not sure if I should do a cleanse or get real strict on my nutrition. I have had great success with both routes before and I just can't decide which one I want to commit to now. I could do the Master Cleanse, the Ayurvedic Diet, Count Calories. To be honest I am a little overwhelmed by the choices. I know I need to make a decision and soon, I just don't know which one to go with. When I was about 40 pounds lighter and in excellent physical condition I told myself I was never going back to where I was. Guess what? I am back here again, and I am pissed about it. I don't want to be at this weight or size. I do want to make a change and be healthy and fit again. I am just struggling with starting. Anyone have suggestions for me? I am all ears! Hmmm. 60. How did that birthday sneak up on me? I used to think that 60 was old – but I sure do not feel that way now. I do not feel old! I feel as energetic now as I did 20 years ago. In fact, when I focus on eating right (and by that I mean right in both quantity and quality), taking the right supplements (for me, Shakeology is a wonder drug), and exercising (right now a combination of running/walking and biking), I can fool myself into thinking I am 40 again . . . well, maybe 50. Of course I know I am lucky – I have good genetics on my side and I am not on any medications. But honestly, I feel my health is up to me. I can choose to do the things I need to do to stay healthy and active, or I can choose to feel old. I choose health. I choose to live the Wholesome and Fit lifestyle! I started my journey about 4 years ago. I weighed in at 300 lbs. The day of my wedding I was so excited to see the pics. I went down the next day to develop the film ... well :( after seeing the pics I realized that even though I knew I was beautiful that day, I was not at all happy ... I decided it was time to change that. After a few years of yo-yo diets, gaining and losing weight, trying hard but not really making it, I decided weight loss surgery was the way for me. I didn't want gastric because I just needed a hand/helper, so I choose the lap band. On June 28, 2012 I went in for surgery. Since that day my life has been nothing but new beginnings and happiness. I lost about 50 lbs with the help of the band,. After that I got stuck again, but instead of letting it get the best of me, I joined a gym. I started lifting weights and clean eating. I lost another 50 lbs on my own. I plateaued again in 2015. So, I hired a coach and I lost an additional 30 lbs. Weighing in at 169 lbs, I made the decision to compete in March of 2015, and I have been getting bigger and badder ever since. On June 25, 2016, weighing in at 150 lbs, I competed in my first body building competition in the figure division. I WON 3RD PLACE. OMG … what a dream, what a day. My head still spins when I think of what I have done with my body. Now, as of August, I have gained back 20 lbs because "stage lean" is not a healthy weight that I can maintain. My current weight is 170 lbs and I feel amazing. I’m currently in a lean bulk to add some muscle size to hopefully get 1st place in the next competition. BIG GOALS! BIG DREAMS! I hope to one day earn my pro card in figure. I’m waiting at the moment for my health insurance to approve skin removal surgery for an abdominoplasty and breast lift due to my huge weight loss. I will also have my lap band removed not due to failure of the device but because (as my weight surgeon says) "I’m a Rock Star" LOL. The band just no longer works with my lifestyle and is really slowing me down from my goals. I’m confident that I will succeed in all my goals because that is what I do ... LOL. My biggest goal in life is to help. I just want every woman, man, and child to know that the work isn’t easy but it's all WORTH IT. Change is possible with dedication and motivation to reach your goals. Anything is possible if you WANT it bad enough. "Let's hike the Big Sand Hill"
How do you get your exercise in when you are traveling? It's challenging sometimes. When I am at home, I get into an exercise routine -- I either force myself to get up early or I decide to quit working mid-afternoon in order to workout to that PiYo DVD or go to a Zumba class. But when I am traveling, it all seems different. Running is a good exercise for travelers. All you need is a pair of running shoes and a sturdy bra (plus shirt and shorts of course). But, alas, I have never been a great runner. 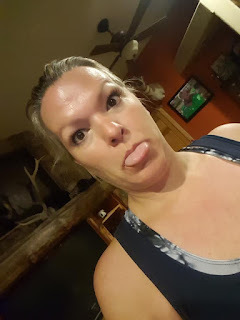 I am too slow, it seems like I only have one lung (my husband says that is called being out of shape LOL), it is too hot outside, or it is too cold. If I am traveling to a big city, I can sometimes find an exercise class at the right time and place, but not always. Or, I can compete with the other travelers for a place on one of the treadmills or weight machines in the hotel exercise room. Sometimes I take all the gear I need to do an in-house workout (yoga mat, strap, block, DVD, player, etc. ), but sometimes that is too cumbersome and bulky to pack. However, I can ALWAYS look for the exercise opportunities present in the world surrounding me. For example, climbing the stairs in my hotel instead of taking the elevator or walking to dinner instead of taking a cab. When I am traveling to see family and friends I can ask someone to walk around the block with me -- and make sure it is a really big block (or two or three). I can hike down and up the "Big Sand Hill" with my grandkids. I can walk in the ocean. The important piece of gear for me when I am traveling is my pedometer. If I focus on getting those 10,000 steps in, I get it done! If I don't focus, I don't get it done. Simple as that. My health is important to me, especially as I want to keep on traveling! So, let's hike the Big Sand Hill.